Philippe looked concerned as Michael and I came slowly to a halt, right beneath the huge hanging glaciers that fringe the Matterhorn’s famous North Face. There were refrigerator sized blocks of fallen ice strewn everywhere as we struggled through the thigh deep afternoon slush, accompanied by a rumbling drumbeat of nearby rock falls. It sounded like we were in a giant bowling alley, only this time we were the pins. Ten nervous minutes later we joined Philippe in safety at the foot of the Zmutt Glacier. Breathing a collective sigh of relief we geared up to continue the final descent into Zermatt, the finishing point for the classic high alpine ski tour ‘The Haute Route’. 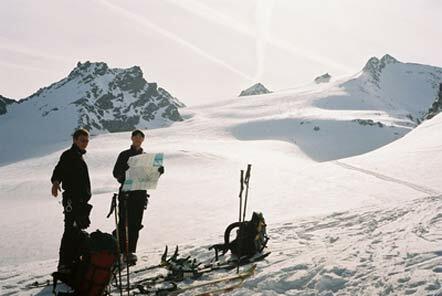 From Chamonix to Zermatt with over 5500m of ascent, crossing 17 glaciers and 10 cols the Haute Route takes you through some of the most remote, untouched scenery in The Alps and is a snowboard-mountaineering must. There are three main variants of the route which take most groups between 5 and 7 days. We planned to do the Verbier variant in five days. 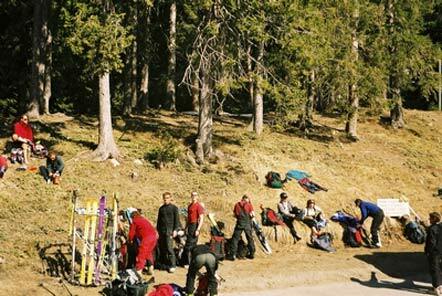 As more and more snowboarders head out into the back-country, more and more equipment is becoming available. The adventurous snowboarder can now choose from snow-shoes, split boards and approach skis for their upwards transportation. I would be using my trusty 168 split-board for the Haute Route and my flatmate Michael ‘The Dane’ was using approach skis. It was late March and the forecast was favourable so we packed our ‘sacs and set the alarm to get the first lift at Grand Montets in the morning. The first day lead us up over the heavily trafficked Col du Chardonnet, the starting point for many classic Chamonix tours. The crowds thinned during the day and by the time we met Philippe at the top of the Fenêtre de Saleina, there were only three or four groups left on the same route as us. Making our way across the Plateau de Trient we were greeted at the refuge de Trient by the fading, deep blue evening light casting a warm glow across the Aiguille du Tour and the other sentinels of this natural amphitheatre. I woke up sunburned and stiff, but the prospect of a 1300m descent to the village of Champex, in Switzerland, eased the pain. It hadn’t snowed for weeks and we were gutted at the thought of what an epic powder-fest it would be with a couple of feet of fresh. I also spotted some awesome looking couloirs, about 40 degrees and 800m of vertical and made a mental note to come back after the next dump. From Champex it’s a short hop on the bus to Verbier, where we thought it only polite to sample the local beer before jumping on the cable car up to the Mont Fort refuge. Bus! Cable car! 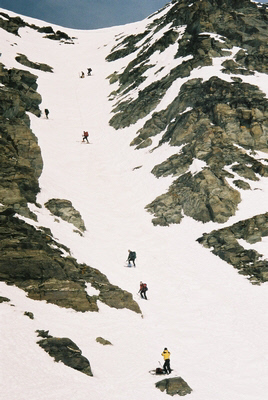 On a ski tour? It’s not exactly hard-core, I know, but hey, two hours walking along a road or sitting in the sun talent-spotting with a beer, what would you choose? 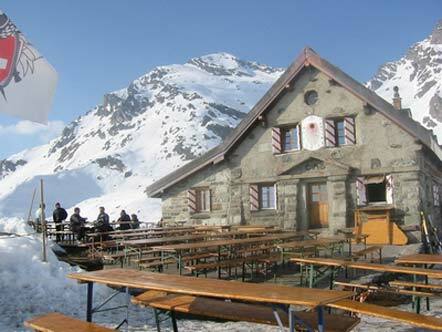 The Mont Fort refuge is situated right in front of the infamous Bec des Rosses, home of the Verbier Extreme contest. I spent the evening sat on the terrace trying to pick out potential lines and not getting very far. When you see the way the likes of Axel Pauporte and Steve Klassen rip down the face it makes you realise just how good they are. 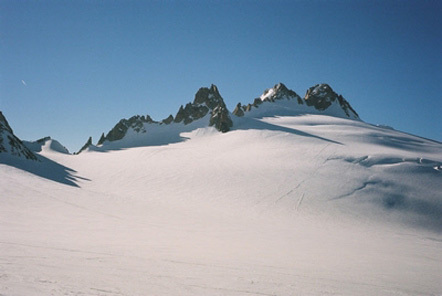 An early morning start to skin up the freshly pisted runs of Verbier should see you at the Col de la Chaux by sunrise. Crossing the col we greeted the sun and left the resort behind. We had decided to take in the summit of the Rosablanche (3333m) en route, and from the summit ridge we spotted a steep couloir plunging down to an untracked powder field. This was too good to be true. The split-board handled the tight, 40° chute well, with only a slight discernible difference to a normal board. The powder descent below was as good as it looked and we all rode down arms aloft with much whooping and no small amount of hollering. Fresh tracks in the Alps a full month since the last snowfall! As is always the way, it was over all too soon and after ripping the whole 600m face in about 4 turns it was time to split the board in two, and put the skins on again. A longer-than-it-looks traverse (suffice to say we won’t be stopping for a siesta beforehand next time!) leads around the beautiful Lac des Dix and takes you to the final, endless climb to the ‘it’s just around the next ridge’ Dix refuge. 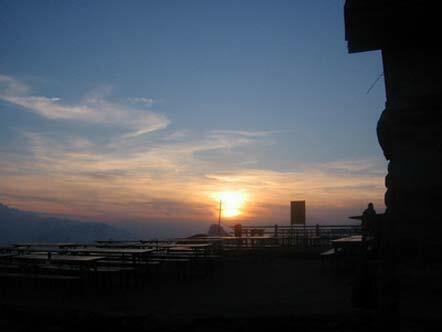 After God knows how many hours of uphill misery we stumbled up to the hut in the failing evening light. I hurled my gear on the floor and sat mumbling and swearing in a good old-fashioned sulk until the sun finally gave up and sank into the shadows. The next morning we woke up to white out conditions and light snowfall. Unfortunately this obscured the view of Mont Blanc de Cheilon as we made a leisurely 8am start across the Glacier de Cheilon. The ascent of the Pigne d’Arolla (3790m) called for some delicate skinning between crevasses and a small section requiring crampons, but nothing too taxing. Our reward for summiting was a break in the clouds, revealing a great view and the 600m descent to the Vignettes refuge, perched atop the cliffs like a fairytale castle. 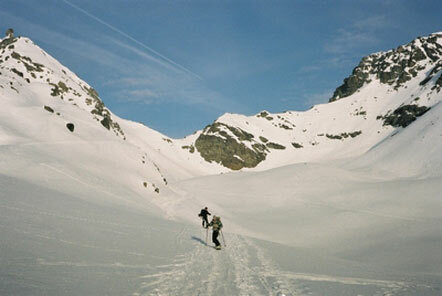 The final day is common to all three Haute Route variants and is one of the best ski mountaineering days in the alps. From watching the sun rise over towering icy peaks on the vast Col de Chermotane, to the lush green valley and busy streets of Zermatt in a little over nine hours. Easy skinning, steep climbing in crampons and powder descents are all on the menu as you draw nearer to the Matterhorn and the long ride down to Zermatt. A minor navigational error took us down to the Zmutt glacier via a steep, twisting couloir, which turned out to be far more interesting than our planned route. Quick tip – if you snowboard the Haute Route you’d be well advised to get your poles out now as the aforementioned flat section below the looming Matterhorn must be crossed. Unfortunately, no one told us that. Having stumbled through the slush to safety we took a few minutes to let our heartbeats settle down to somewhere near a normal rate (with a little help from The Dane’s hipflask) and to reflect on the last five days before heading down to Zermatt. Joining the busy pistes and even busier streets of Zermatt, with all its image conscious apres-ski crowd takes a little getting used to after 5 days in the wilds, and a night in a ‘cheap’ Zermatt hotel leaves you feeling positively violated. 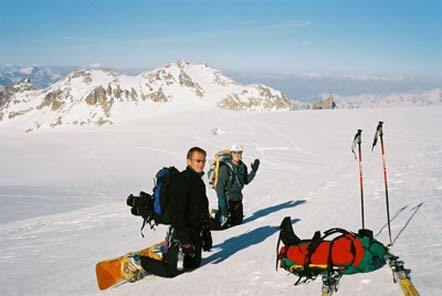 Lack of funds caused Michael and I to abandon our plans of carrying on from Zermatt and climbing/ riding Monte Rosa, Western Europe’s second highest mountain. So with mixed feelings we hitched home the next day, but I’ve a feeling we’ll be back before long to finish the job. Robbie Callow is 27 years old and works as a snowboard instructor, engineer or writer depending on what mood he's in. When not climbing up or riding down mountains he can be found on a remote beach somewhere searching for the perfect wave.